Jesus chose the first disciples right here in chapter 4. He didn't invite applications, he didn't interview, he didn't even arrange a time to meet people. He was wandering along the shoreline of the sea of Galilee when he called Simon (Peter) and Andrew. There is no record of any dialogue and no person specification to measure up to - just one command requiring one response. It's the same today Jesus calls you, not because you have an amazing CV, not because of your past achievements but because he wants you with him. There's no test, no forms to fill in - just one command come, follow me. (4:19) How do you respond? Do you have questions like; How do I live as a Christian? What do I do? What should I say? How do I behave? Jesus tells the disciples that he will make them fishers of men but he doesn't expect them to just know it, to just go out and do it. Chapter 5 is more than just wonderful poetry in the Beatitudes, it is reach with teaching. Jesus does not put his disciples straight into the crowd. Chapter 5 verses 1 and 2, say that he sees the crowds and then takes his disciples up a mountainside to teach them. That teaching starts with the beatitudes, he is looking down over the crowd and describing all sorts of different people, from various walks of life and with various needs; the poor, the lost, the broken hearted and the hungry. He teaches them about how to behave; they are to be meek, merciful and pure peacemakers, even in the face of persecution. He warns them, they will be persecuted but they cannot hide, they must let their light shine. Jesus continues in chapter 5 to teach the disciples, and us, what to say in response to the questions they will be asked. Each new paragraph starts "you have heard it said" or "it has been said", as he refers to the laws of the time. 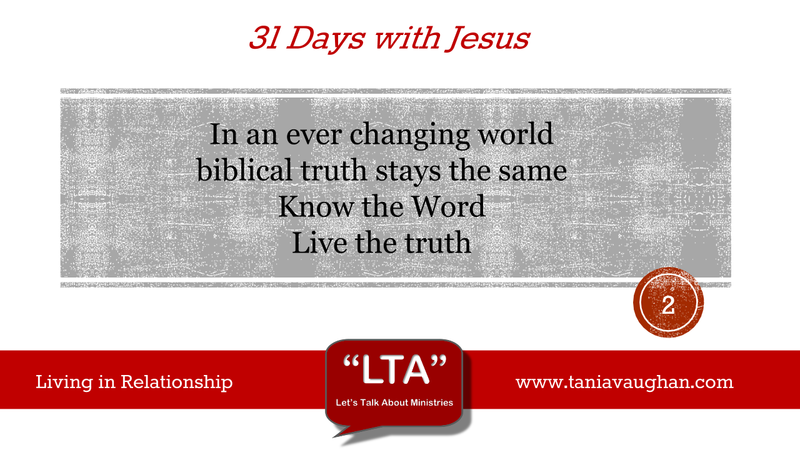 Jesus did not change the law, he enhanced it, he made it less ambiguous. The laws around murder, adultery, divorce, revenge and enemies were clear but did not match with Christian truth. Many of these laws have been updated but the biblical truth has not changed, making the Christian stand point as unpopular now as it was then. As you sit on the mountainside, what questions or laws do you face today that you need ask Jesus about? Do you allow fear to hold you back from speaking God's truth, because it's not popular? Lord, I know that your ways are perfect and yet they are often so far from the ways of the world we live in. Give me courage to stand by your truths and not to live in fear of being unpopular. Help me to learn and better understand the truths in your word. I want to not only live by them but teach and encourage others in your ways. Lord, help me to grow in my relationship with you so that I can witness your goodness in the way that I live my life. Thanks for today's study! I have always liked the mental image of JC strolling down a beach looking for some specific and finding 4 fisherman. There's no Alan Sugar apprentice style qualification process 'do this well and you're hired'. JC already knows you are good enough even though you don't know it. No 'disciple academy'for Simon or James! So it is for us. Spending time with Him is the most important thing we will do in a day. Sometimes in the busyness of our lives we forget how much he wants to spend time with us and how much we need to spend time with Him. Thanks for sharing. Glad I found you on SITS today.